Martins Fork is the hike we begin every season with. For our new members who have never been hiking before, it is a wonderful introduction. But it is also full of variety, a conditioning walk without being exhausting, and very photogenic. To reach the trailhead, leave the Mountain Parkway at the Slade exit, turn left, go under the parkway, turn left on 11-15, and drive to the Nada Bridge. Turn right on 77, drive through the little village of Nada, climb the hill, go through the tunnel, follow the twisting switchbacks down the hill, and at the bottom immediately to your left find the parking lot. 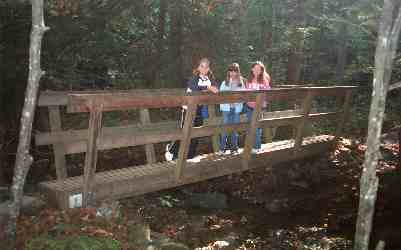 The trail begins at the wooden bridge across the road. 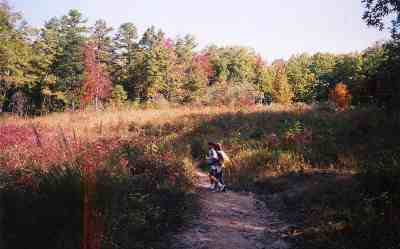 Especially if you have new or infrequent hikers along, allow about six hours. 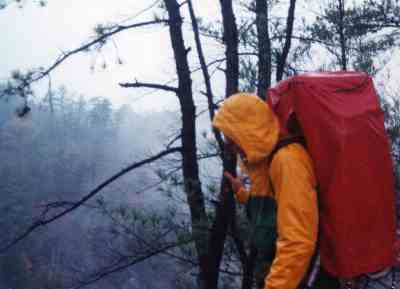 Bring the usual lunch, water, rain gear, change of socks, talcum powder, and day pack. Somebody in the group should have a first aid kit, binoculars, and camera. We highly recommend wearing two pair of socks, one thick, one thin, and thoroughly dusting the feet, the outer side of the thin socks, and the outer side of the thick socks, before lacing up the boots. We also urge a few minutes of stretching exercises and a good pair of trekking poles. When you first cross the bridge (below), you will find yourself in a 3/4 mile long, narrow, wooded valley between towering cliffs. 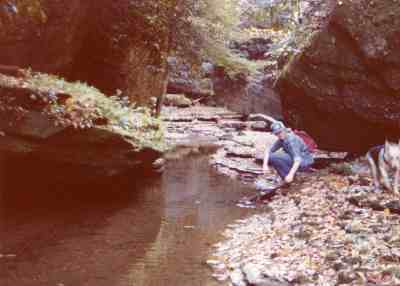 The stream, Martins Fork, is usually small and meandering. 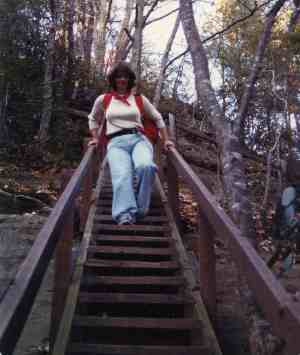 When it is, this is a fairly dry trail which crosses back and forth 12 times by way of stepping stones. After a dry Summer, it may be a long step across. But if you try this trail in the Spring, the trail may be half underwater or, at best, very muddy. The stream crossings become wadings. 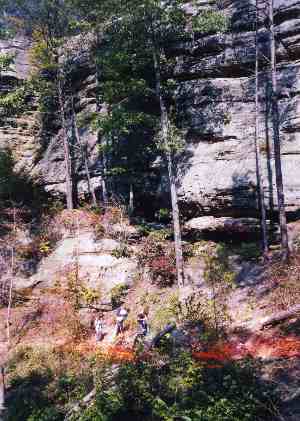 Martins Fork is prime rock climbing country. You will probably see climbers and their gear back in the parking lot, or along the first part of the trail. To your right and your left, trails lead off to nationally known climbing sites. These are only a quarter mile off the main route, so you might wish to follow one or more of those trails and watch for a while. The Military Wall trail heads off to your right, climbs the shoulder, passes Slot Rock (below), and comes to two great climbing locales. 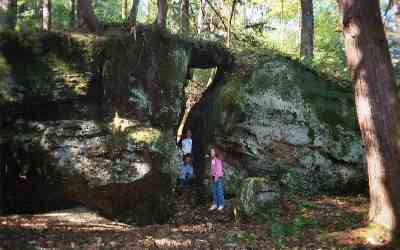 You may wish to pause to walk through and behind Slot Rock, an unusual little formation. Once you get past the climbing sites, traffic on the trail thins out considerably. 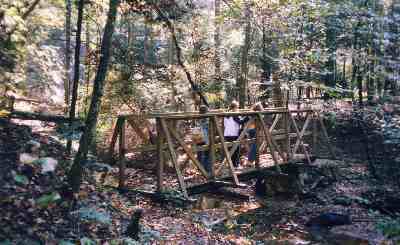 You will have a pleasant stroll along a bubbling brook with hardwoods, pines, ferns and, in season, wildflowers. Small fish called darters live in this stream. So do crayfish. Human footprints at the crossings have obliterated them, but if you look carefully at other places you can see raccoon, possum, skunk, and wildcat tracks in the sand and mud. Martins Fork flows clean, but unfortunately no stream flows completely clean anymore, so if you need to drink this water you should purify it first. The microbe Giardia Lambdia has been found in water samples, not every time, but enough to pose a risk. Giardia causes intestinal distress : gas, bloating, cramping and diarrhea. 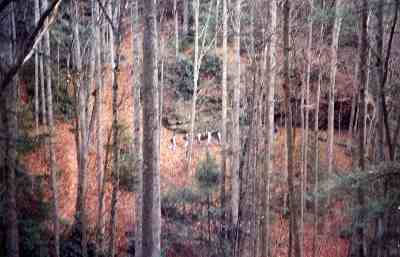 Perhaps becaue it was always in such deep shade, the Adena called this The Valley of The Poor Hunting. They rarely came here, and neither did their successors the Shawnee. After 3/4 of a mile the trail suddenly begins climbing to the left and leaves the stream behind. You will switchback 400 feet in half a mile but unfortunately the scenery turns rather sad. 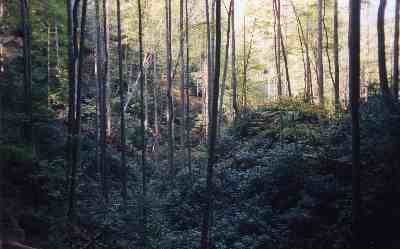 This used to be one of the great rhododendron forests in the Gorge. 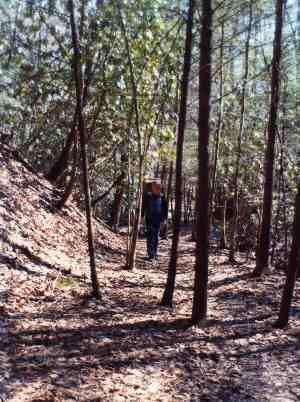 The glossy leaved shrubs grew to full size trees here, and the trail became a tunnel in places. The dark corridor protected hikers on the long struggle uphill. No more. Severe storms have devastated the area. Gnarled trunks and branches are down everywhere, and you are hiking in bright sun. You can now see across and up and down the valley, but the rhododendron forest was more impressive. 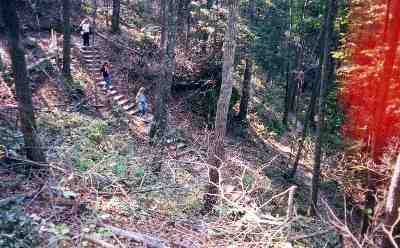 Downed hemlock trunks also block access to the wooden steps which led up the open rockface. 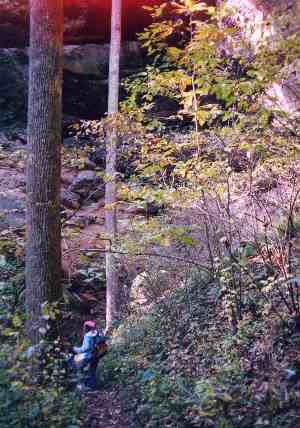 In the picture to the right, for example, the three hikers are on the trail directly below Harrison Point. 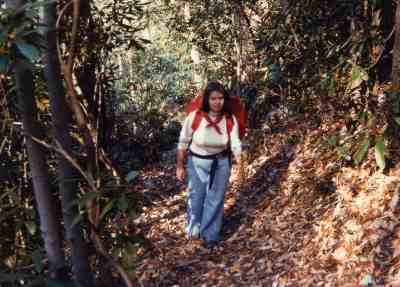 In the past, they would have been hiking in deep shade. This year, they're in full sunlight. Some of the blow down is visible in this photo, but when actually on the trail the vista of dead trees and branches whitening in the sun is distressing. Just past this photo, you cut back to your left and climb some steps improvised in the rock. 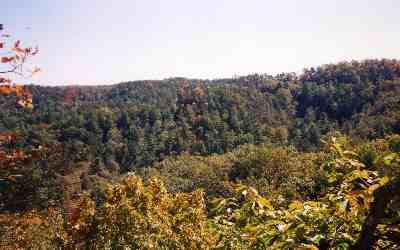 Precisely as you reach the ridgetop, look for a faint trail leading off to your left. This is the well disguised entrance to Harrison Point, one of the great lookout points in the Gorge. You're too early for lunch, but Harrison Point would make a fine midmorning pause after the climb out of the valley. You're looking all the way back down Martins Fork, framed by snaking cliff faces to the right and left. Red tailed hawks can often be seen riding the thermal currents, and in late evening ornithologists come here to record whippoorwill calls. 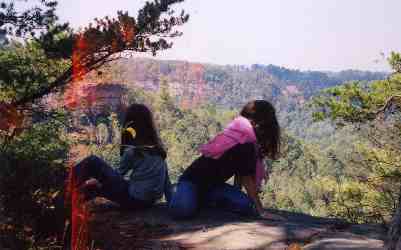 Since this location is so scenic and so close to the road, it receives quite a bit of use as a campsite. You may find fire scars not cleaned up by recent campers. We always carry trash bags and clean up such blemishes, and you could do everyone a favor by doing the same. If you do return to camp here, expect to be joined by a Vole, a large resident rodent active at night. From here the main trail travels about 50 yards , then intersects the ridgetop trail and turns left. You will then walk about 100 yards and come to the next scene of interest. This is a medium sized clearing in the middle of the forest. Normally, if a fire or high wind created such an opening, it would go through a predictable succession cycle and return to young forest in several years. This one seems frozen in the third year of succession; it has six foot tall canopy annuals like Joe Pye Weed and Ironweed, various berry bushes, and tall grasses. Early in the 20th Century, this was a staging site for the timbering operation that stripped most of the big trees from this part of the Gorge. They parked their heavy horsedrawn equipment here, maintained tent offices for foremen, coordinated each day's work, and stacked supplies. In doing so over two decades, they compressed the soil so tightly trees have not been able to grow here. As the annuals and biannuals loosen up the soil, the trees will eventually return. This is what the rhododendron forest coming from Martins Fork up to Harrison Point used to look like before the devastating fire. Compare this photo to the one above with the three girls out in the open. Iron rings in the boulders along House Rock Creek. A brief iron industry sprang up here but deposits had too low concentration to support it for long. You'll see lots of these on the sides of the boulders and cliffs hiking from Grays Arch down to House Rock Creek, which appears on some maps as Kings Creek. They do appear in places else where in the Gorge, but not in the same concentration. This is the staircase descending to the base of Grays Arch, a good lunch stop. 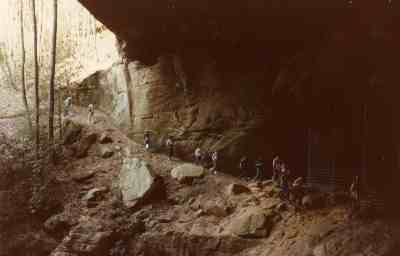 You will walk about half a mile on the level, then begin dropping, first gently, then more and more steeply, and finally down stairs, until you come to Grays Arch, one of the biggest natural arches in the whole Gorge. As you come to the foot of the final staircase (right above), turn right to the Arch. You will almost immediately drop down a steep descent to the scene on the right. If you follow the main trail, it will cross the stream and veer sharply to the left, then switchback up the hill to the Arch. You could also leave the trail and scramble across the giant rockpile under the rock shelter, as seen in the photo to the left. You can work your way up under the shelter, then to the left, and come out under the Arch precisely where the trail comes up. 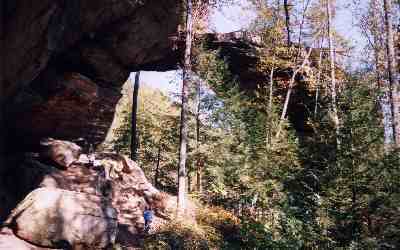 The Arch is a natural lunch stop. After everyone has had the chance to climb on the rocks, cool their faces under the waterfall and eat lunch, retrace your steps to the bottom of the staircase and turn right. Here, the scenery changes again. You'll hike down to House Rock Creek (Kings Branch on some maps), past boulders as big as houses. 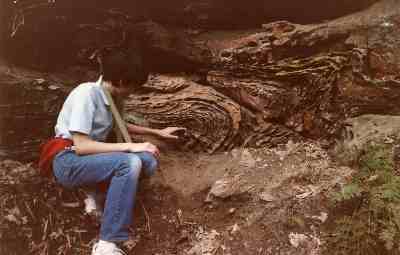 The reddish brown swirling patterns in the rocks are iron deposits. They created a brief iron furnace boom in Kentucky, but the iron was not concentrated enough to be competitive with the greater deposits elsewhere, and the boom was short lived. If you left the trail and bushwacked downstream, you could look up at Rush Ridge to your right. You could see a slight saddle in that ridge. You can work your way uphill to that saddle, cross through it, and drop down into the next valley. From the saddle in Rush Ridge, if you look straight across to the East, you will see a very definite gap in the next ridge. That is Pinch Em Tight Gap. You could bushwack your way across to that, and drop down into Adena Meadows below Chimney Top Rock. This is one of the favorite off trail routes in the Gorge. The abandoned furnaces can still be seen over a several county area. Once you hopskotch across House Rock Creek (also called Kings Branch), you face Fingernail Hill, one of the longer and steeper ascents in the gorge. After this trail has wound steadily uphill, switchbacked twice, climbed 17 and 20 wood steps and winded hikers, it levels out on Rush Ridge. The intersection offers a trail dropping off to the left, heading over to Pinchemtight Ridge, but ignore this and follow the level ridgetop for two miles. 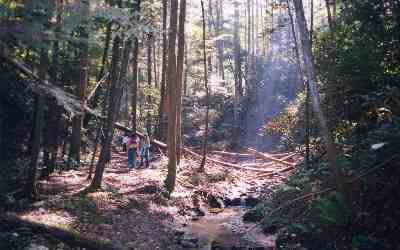 This is a classic forest, comprised mainly of oak, hemlock, elm, sassafras and rhododendron. You can also find great distant views of Grays Arch. You find a real luxury here, a fine rest stop. Tunnel Ridge Road, a gravel fire route, comes in from your left. 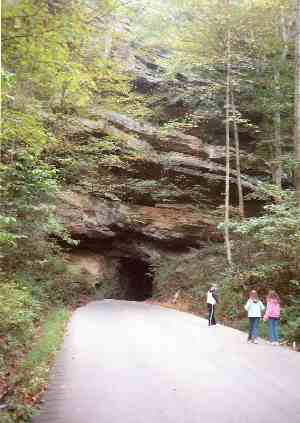 Turn right, follow the road around the bend, and you reach Grays Arch Trailhead, with picnic tables and portapotties. Enjoy a midafternoon snack, change socks, and spread your topo maps out on the tables. Then head west to the corner of the parking lot. The trail drops on down to your right (as in the photo above) and disappears back into rugged country. In the Spring, this hillside is one of the great displays of white and pink Lady Slipper found anywhere. Year round, it is also home to great colonies of New York, Cinammon, Ebony Spleenwort, Bracken and Walking ferns. 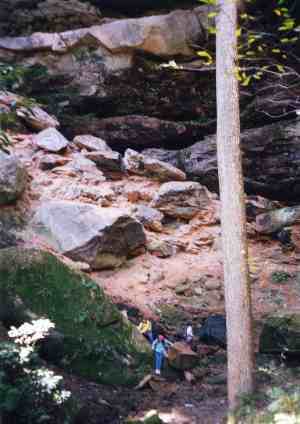 Between boulders, you descend staircases deep into the headwaters of Martins Fork. And then you come to one of the great historical locations in Kentucky : the remains of the handmade hut where Daniel Boone spent his first winter in the state.He chose the site well. Deep back within an overhang, the hut was never rained or snowed on. He could build a fire and cook or warm himself without getting out in the weather. He could look down the long valley and see anyone coming up toward him. The ridge above is too high and steep for anyone to come over the top; they had to come around and approach him from the front, in full view. Shielded from the wind in cold weather, a natural spring kept the rock shelter cool in hot weather. Daniel had a supply of fresh water without exposing himself to an enemy or going out in harsh weather. He could stock a whole winter's wood back in the dry recesses, and the heat from a fire would be reflected by the rock walls. It is unlikely he actually slept in the small hut very often, since sleeping between the fire and the wall would have kept him quite warm and dry and allowed him to keep a watchful eye on the trail approaching from below. Yale University has carbon dated the hut and validated several artifacts, so there isn't much doubt this really was Daniel's home away from home. 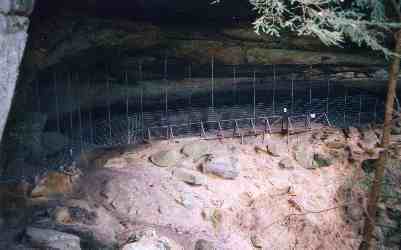 A chainlink fence safeguards the hut, the site, and a nitre site further along the ledge. 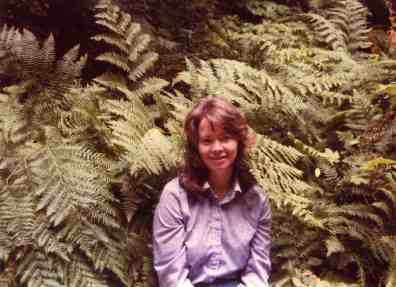 From here on, the trail cuts wide around the cirque, then gradually descends through beautiful forest and, closer to the bottom, a fairly heavy colony of ground fern, horsetail, liverwort and other primitive plants. 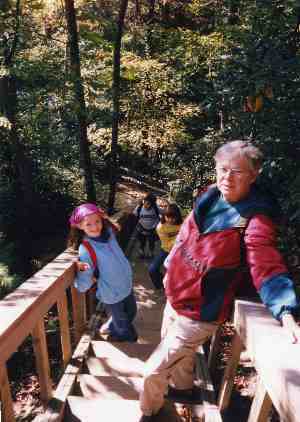 Then you're back on the Martin's Fork Trail, where you began several hours ago. While you're retracing your steps, you might want to watch for Maidenhair, and Ebony Spleenwort, two of the most elegant ferns, which grow especially large here.